Although Sibiu, like many towns, has it’s fair share of hastily constructed apartment blocks they are located on the fringes of the town and don’t seem too invasive. The medieval old town is confined within 10-metre tall ramparts and thankfully is large enough to get lost in for a good few hours. 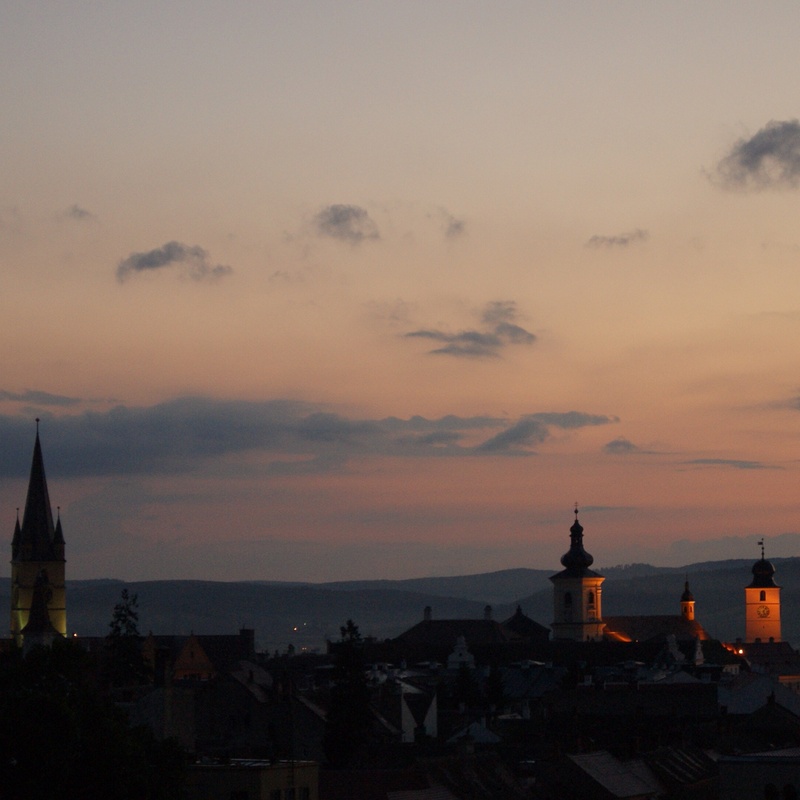 The days that I had spent in Sibiu it seemed like it was going to be impossible for me to connect with the city in any memorable way. The streets were cluttered with too much traffic, too many cafés and icecream stalls, too many plastic chairs and beer advertising, cables running across it’s cobbled squares to music speakers blaring out the latest hits of the Romanian singer Smiley. 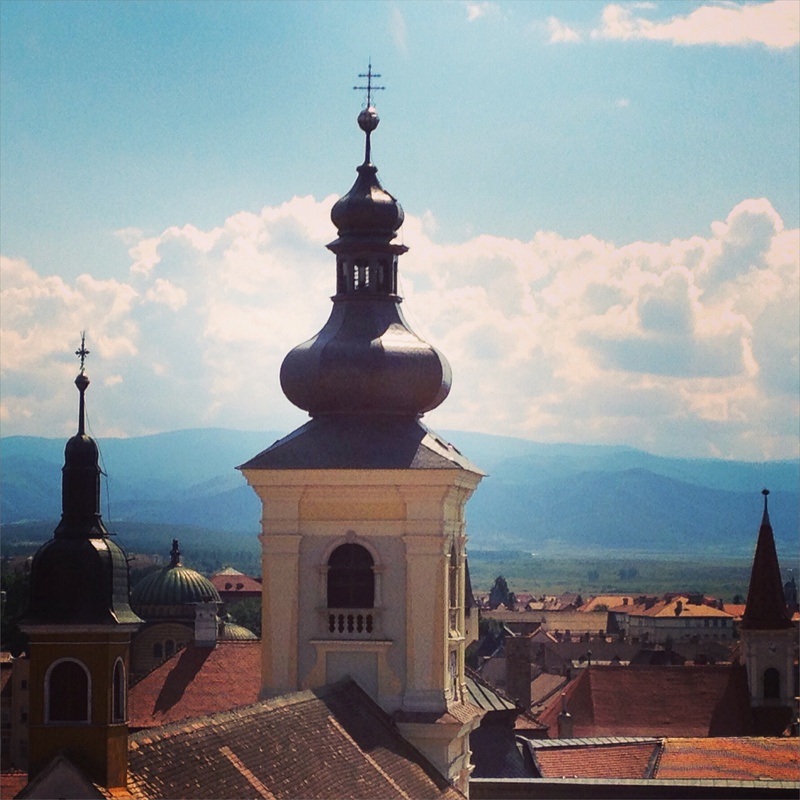 I had resigned myself to the fact that Sibiu was beautiful but that is all it would ever be. That was until I discovered the town just after dawn. It was my last full day in Transylvania and I didn’t really have any idea of how to spend my time. I toyed with the idea of chartering a taxi to drive me across the Transfăgărășan mountain pass but in the end decided just to get lost in the backstreets of Sibiu. I woke up before dawn and by 6.30am was having breakfast in the hotel. It had been interesting staying there watching various groups pass through on their tours through Romania. Yesterday there had been a group from the Far East who had hardly acknowledged each other, the day before polite elderly Germans who sat together quietly and today what seemed like army generals in their uniforms joking boisterously. By 7.15 I was walking along Strada Nicolae Bălcescu, the pedestrian street leading from my hotel to the main square on the most glorious of summer mornings, the candy coloured buildings topped off with a sky the bluest of blue . The main square Piaţa Mare was almost empty, it’s cafés thankfully closed and the inevitable plastic chairs stacked neatly away. A frail old woman in threadbare clothes sat on one of the benches smiling while looking at the pigeons who were crowded around a small boy who was throwing bread crumbs for them, the bread broken off from a loaf by an older woman possibly his mother, nearby in the doorway of the Baroque Bruckenthal Museum two teenagers were embraced and kissing awkwardly, near the entrance of the custard and powder blue Jesuit Church a small group of people had gathered clutching strands of wheat, probably something to do with the Christian holy day of St. Peter and St. Paul. I wandered through the arches below the whitewashed tower of Turnul Sfatului, where the day before I had climbed it’s stairs to Beethoven’s Moonlight Sonata which the caretaker had been playing through the tower’s sound system, how sublime it had seemed looking out of the tower above a sea of red tiles. 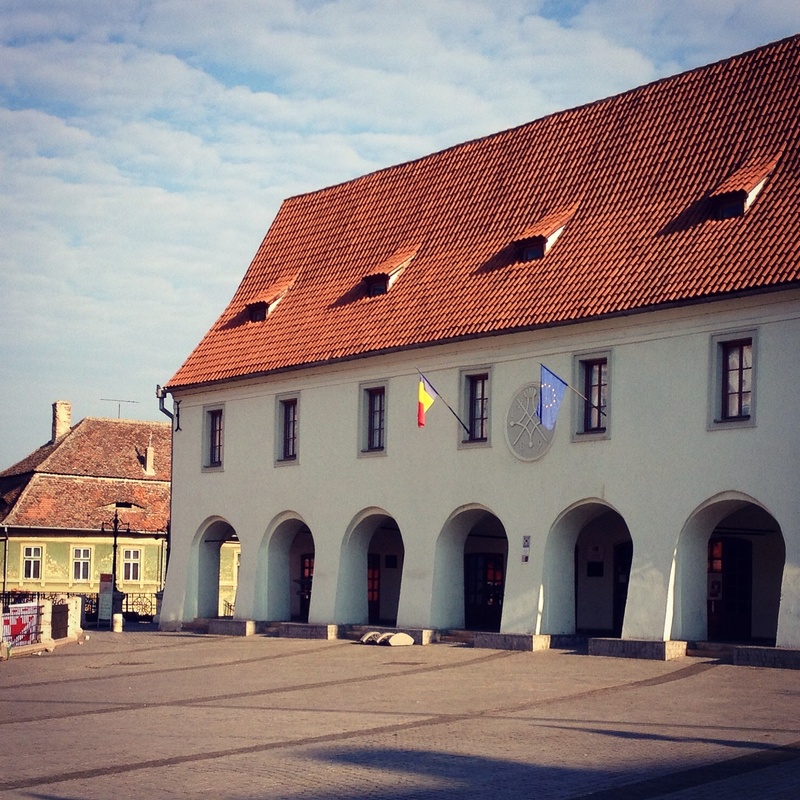 In Piaţa Mica, Sibiu’s lesser square, I sat on a grey wall absorbing the architecture and looking at the colours and details of the roofs with their attic windows designed to look like eyes by the God-fearing Saxons. Almost every building had “eyes” to remind the town’s inhabitants that God was always watching their every move, of his ever-presence, in some ways similar to the Muezzin’s Call to Prayer. Much later these “eyes” had been used by snipers during the winter of ’89 when shoppers had been gunned down during their secret holiday, Christmas. Now and again lone shadows would pass me by on their way to work but most of the time I was alone. The bells of the Jesuit Catholic church began to chime to signal we were approaching 8am, followed by the bells of the Evangelical Lutheran Cathedral, their conflicting notes dancing above my head, almost but not quite deafening out some chirping birds who were scavenging for scraps not far from where I was sitting. 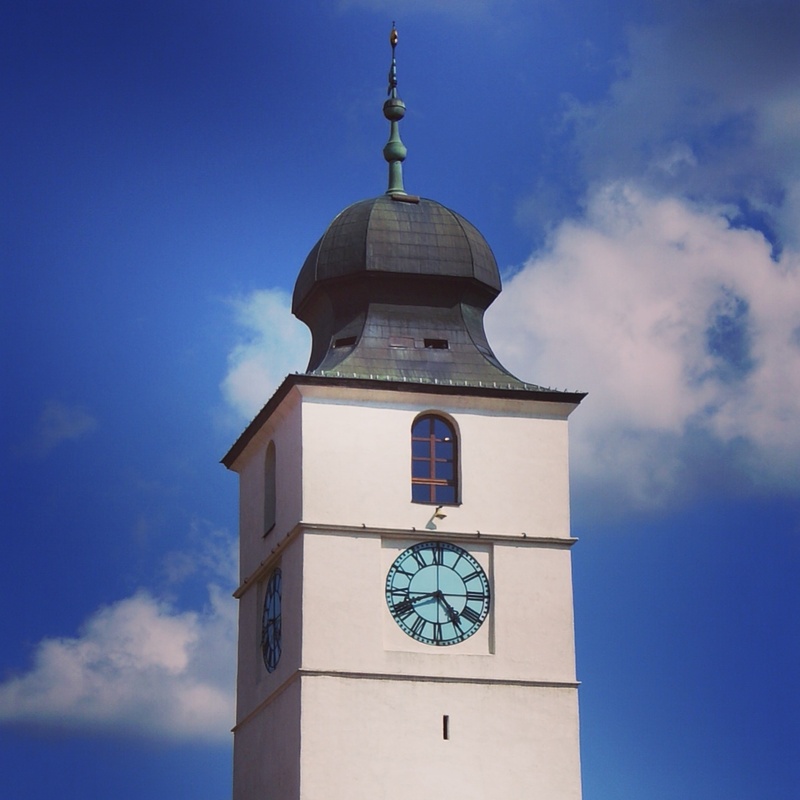 I had remembered that first Sunday morning walking through the streets how Sibiu seemed to greet me with church bells and now it seemed almost as if the city was saying goodbye. I realised that very moment that this was my unexpected highlight of Romania, sitting in one of Europe’s most beautiful squares having it all to myself. If it wasn’t for the parked cars in a corner of the square then I could almost have been peering into Sibiu of a hundred years ago. By now a quarter of an hour had passed and the bells were still chiming. I decided to view the square from another angle and sat on the steps of the town’s oldest building, the 14th century Casa Arts before slowly sighing while standing on the iron Bridge of Lies, called so because it’s said the bridge would collapse if a lie was to be told while standing on it. 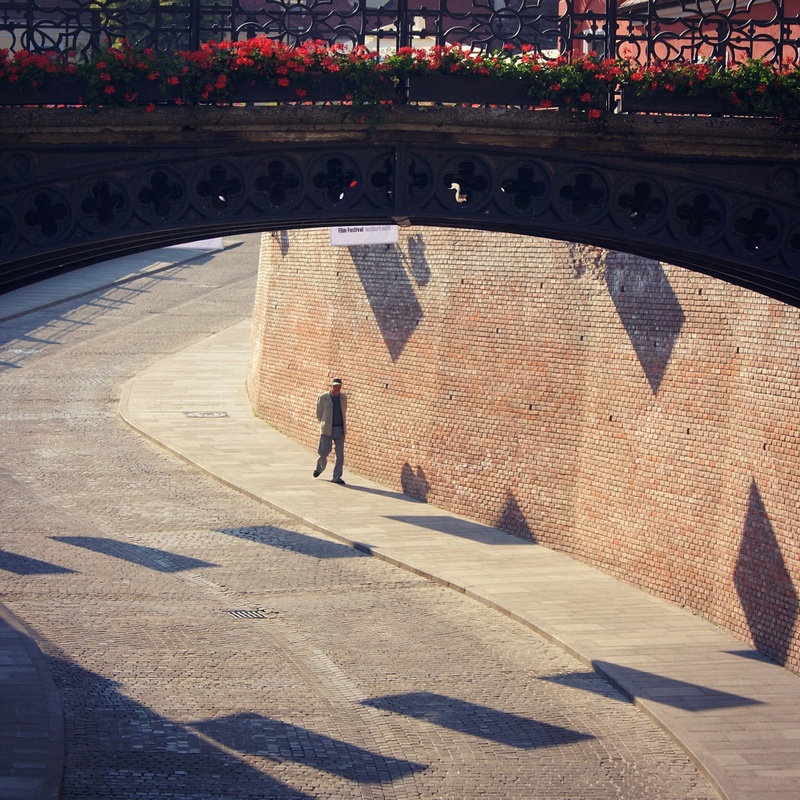 Such a romantic spot in Sibiu since the 19th century others had interpreted the name as from the thousands of times lovers had stood on it whispering sugar-coated deceit to one another. I passed the tangerine and red façade of the Baroque Casa Luxembourg, one of the town’s most famous inns before turning right following a narrow tunnel into Piaţa Huet, again a charming square surrounded by pretty townhouses with faded wooden shutters and window gardens reminiscent of Provence. In the centre of the oval square stood the Evangelical Lutheran Cathedral concealing it’s paintings depicting evil, only this time not in the form of the devil but what the Saxons had viewed as Satanic, the Ottomans. I followed stone steps leading down the redbrick ramparts of the Upper Town into the forgotten Lower Town, often described as dangerous and best avoided but to me the most exquisite part of all Sibiu. Long inhabited by the poor at the foot of the town’s outer defensive walls it seemed a world away from the grand squares and pretentious laughter of the fashionable cafés of the Piaţa Mare. I noticed over previous days that there were almost no tourists in the Lower Town, the authenticity drawing me back time and time again. It reminded me of photos I had seen of the Upper Town from twenty years ago. Faded buildings, no advertising or tourist buses and minimal street furniture. The Upper Town had been spruced up for it’s year as European Capital of Culture and at times felt airbrushed. Down here in this dubious world I had adored Piaţa Coroana, a narrow triangular square hemmed in between dilapidated buildings. Some afternoons I had sat at it’s fountain mesmerized by a particular red building from the 14th century which I felt would collapse any day now. Down here even though the shops seemed empty there was a sense of community. Women stood in doorways chatting to each other, children playing in the streets like they used to do in western Europe before the onslaught of technology. I could already see the Lower Town of the future, gentrification, and it’s demise. The signs were already there, designer shops and hotels would take over, prices would rise, the poor would be forced into cheaper satellite towns. I wondered if it’s inhabitants knew what lay ahead. On my last day in Sibiu I only had one more place to revisit. It’s strange when travelling how certain places can lure you back time and time again. In Milan it had been to the cloister of the Santa Maria della Grazie. I used to sit there most afternoons and sometimes revist it’s inner chapel to view Da Vinci’s Last Supper. 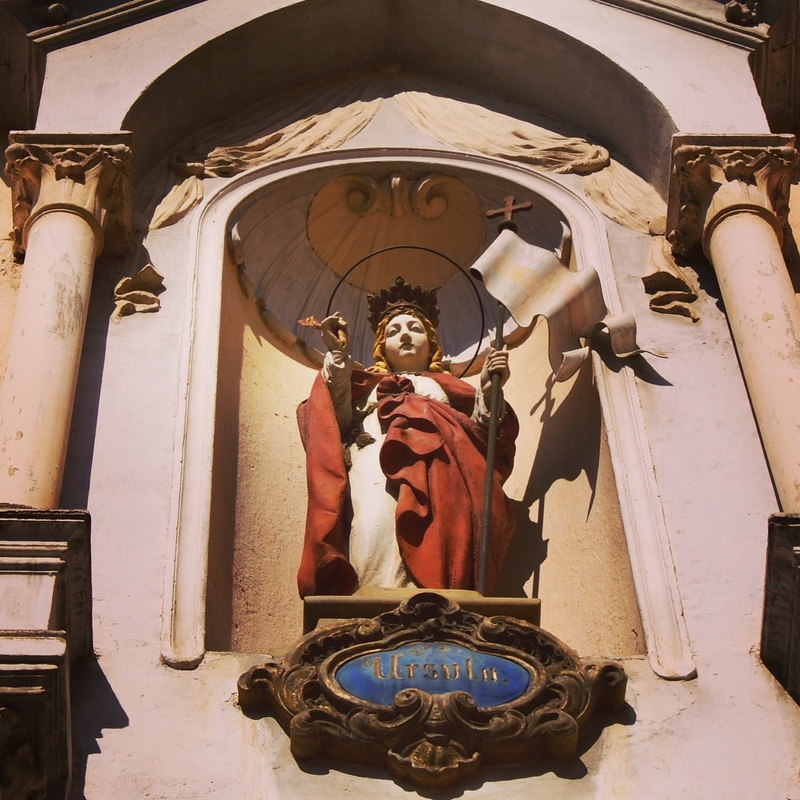 This time in Sibiu it’s magnet had been it’s oldest place of worship, the Church of the Ursulines, once a Dominican monastery. 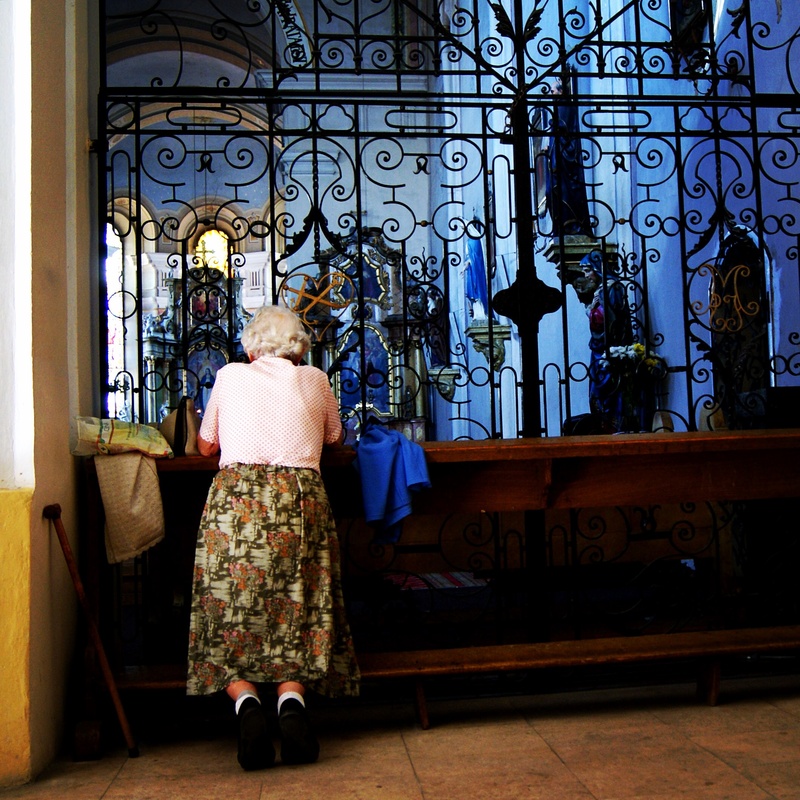 Not a religious person myself, at first it was just a place to escape the afternoon heat where I would sit on a pulpit in the shadow of an alcove but after time watching people coming to pray had been in some way touching. I will never forget Sibiu and it’s inhabitants, the woman dressed in jeans from the eighties who, cigarette hanging from her lower lip, had explained how to buy a bus ticket, and the smiling girl in the grocery store on Calea Dumbrăvii who tried to advise me on a suitable vegetarian restaurant, the patient people on the street who tried to understand what I was asking, the man who offered me a lift in his car when I was stranded on the outskirts of town, the elegant woman in sunglasses who had walked with me along the street to show me the postoffice and all of the other people who had gone out of their way to make a visitor feel welcome. 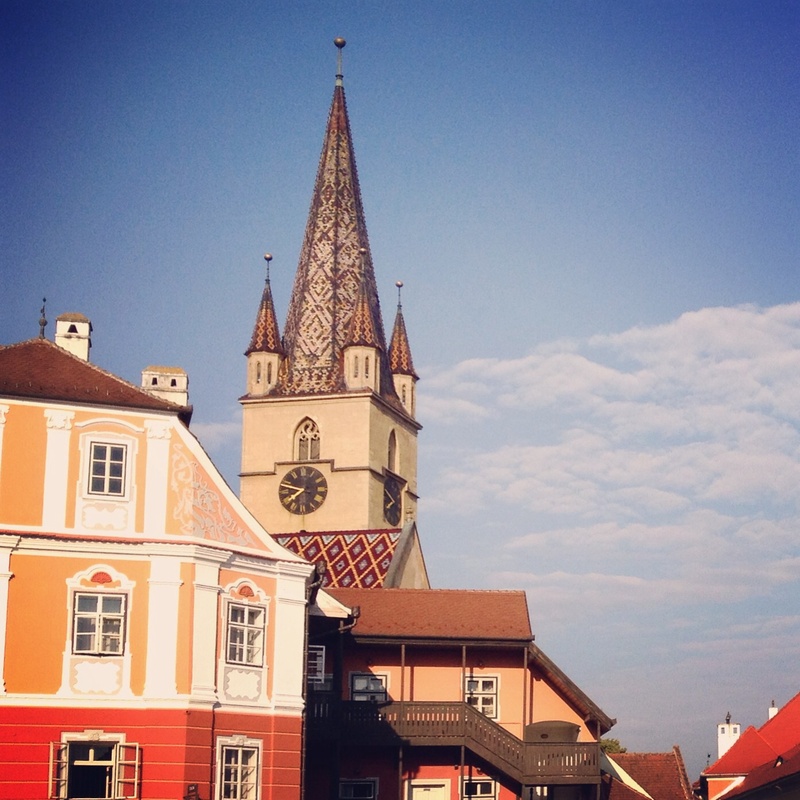 Don’t ever change Sibiu, stay just the way you are. Subscribe via email to my blog. Next up: A stroll through Bucharest. This entry was posted in Romania and tagged Hermannstadt, Piata Huet, Piata Mare, Piata Mica, Romania, Sibiu, Siebenburgen, Transylvania. Bookmark the permalink. 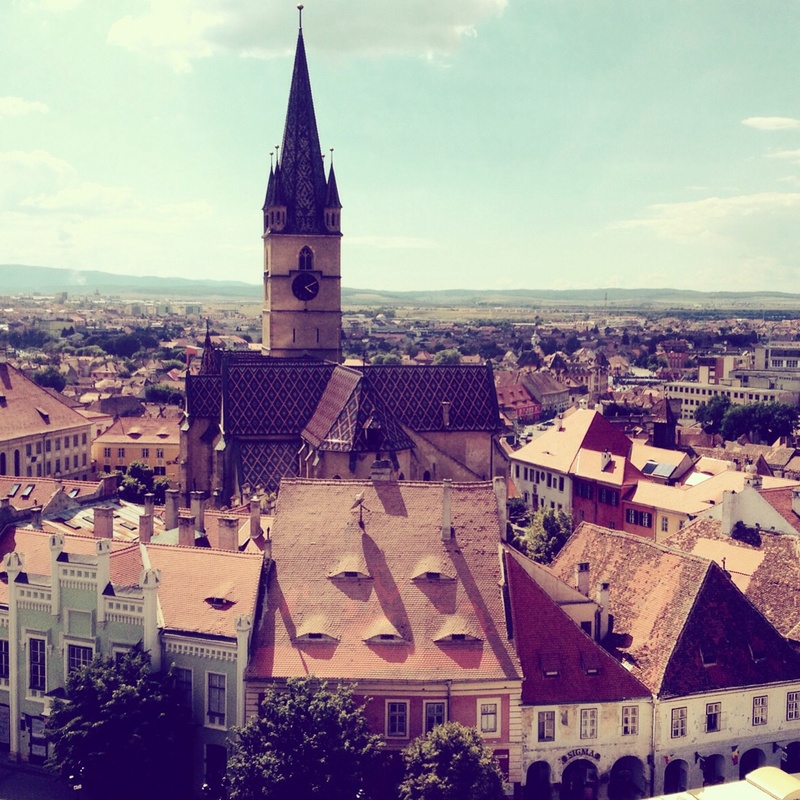 ← The eyes of Sibiu. Thank you so much, yes I noticed cats eyes windows in other towns across Transylvania too. Such a beautiful county i’d love to return one day. 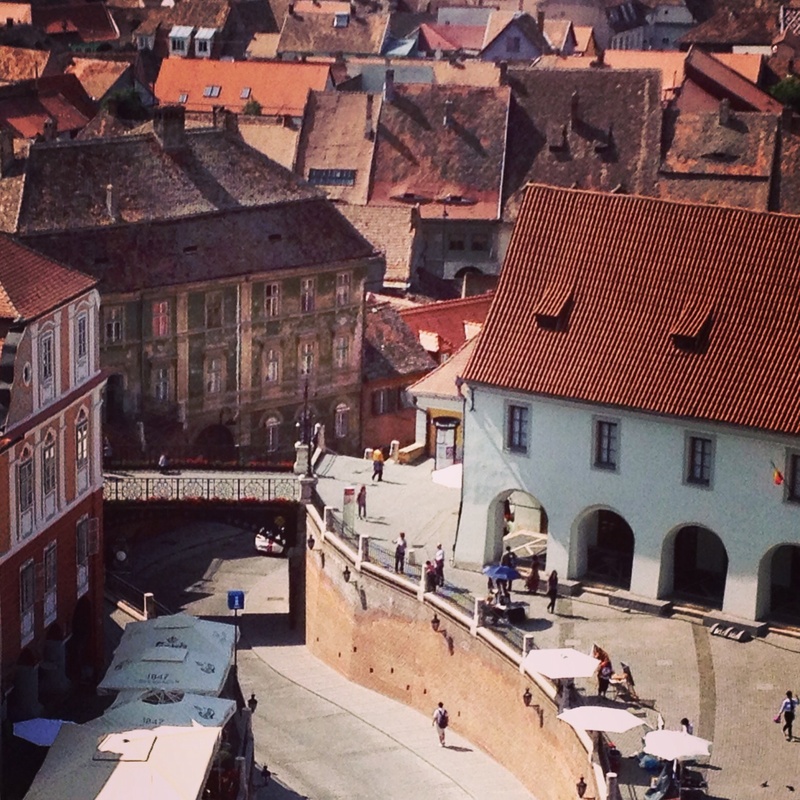 I simply can’t help but marvel at the wonderful photos you have taken of Sibiu. Your narratives seem to capture exactly what those photos seem to convey. Amazing!! interesting how much of the architecture is similar to Krakow in Poland or town in Hungary. 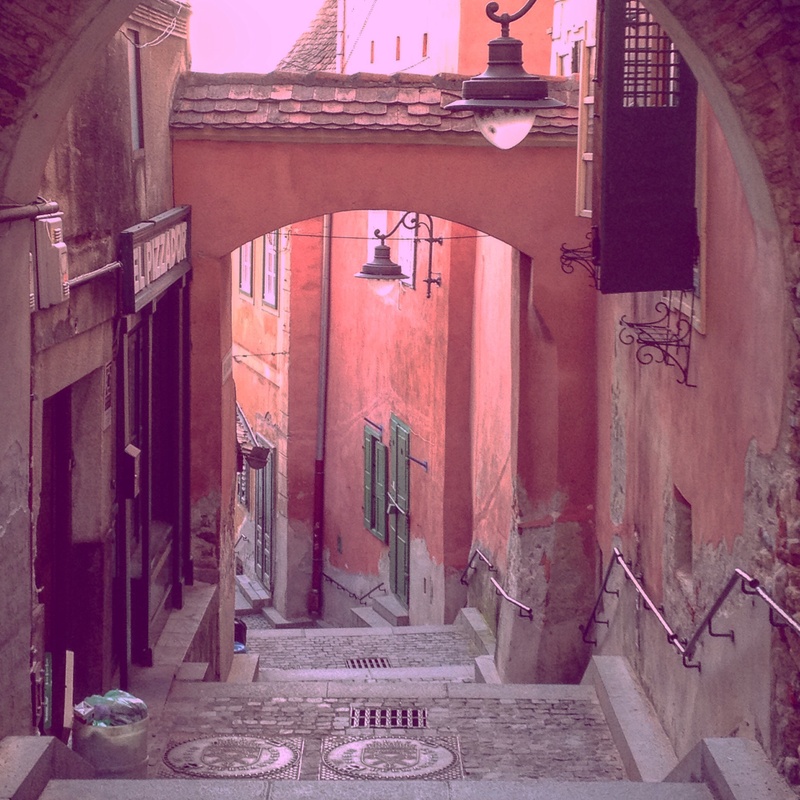 I like your narrative – you have transported me to the Sibiu past – it’s lovely. Thanks for sharing and looking forward to read about Bucharest. P.S. I still think those windows which look like eyes are creepy and scary! Thanks Kat, i’ve never had the feeling of being watched as strongly as in Sibiu, remembering that the town is in Transylvania with it’s legends and vampires made it even more sinister but I really liked the town in the end. Yet another weekend is here, hope you’re enjoying it!